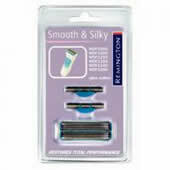 Replacement Remington Smooth & Silky Lady Shaver Foil. Fit's Remington Smooth & Silky range of Lady shavers. Foil & Cutter should be replaced at least every twelve to eighteen months. Replacing your Foil & Cutter gives a 25% closer and faster shave. I really doubted I would find a replacement foil for my old model shaver. This website had the product I needed. A great find. The price was reasonable and delivery was super quick. I would definitely use this company again.